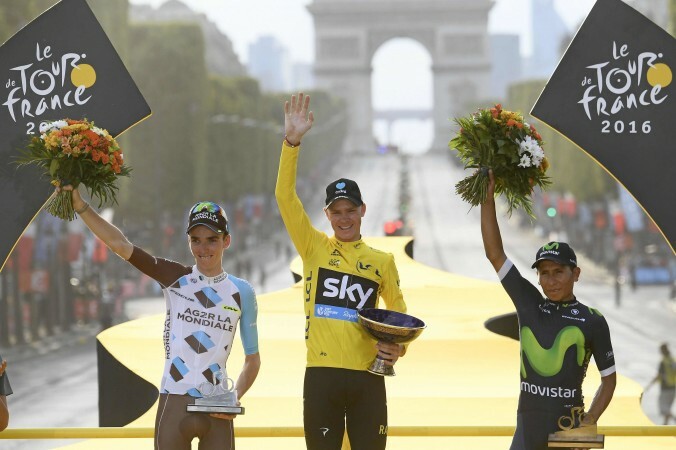 Tour de France Prize Money – How Much Does the Winner Get? How much does the winner of the Tour de France earn? Do the 200-or-so riders in the Tour de France push themselves to the limit over three gruelling weeks knowing that they have a nice pot of money waiting for them at the Champs Elysees? We were interested to find out, so we did our homework and reviewed the official 2016 Tour de France rules and by-laws so we could fill you in too. The total prize money pool is adjusted every year and released immediately before the start of the Tour. The 2016 money pot increased 8% from 2015, taking the total prize money to €2,295,850 or approximately AU$3.2 million. When you read this article, be aware that the prize money goes to the team before it ends up in the pockets of individual riders. It is common practice for the prize money to be split between all members of the team, including mechanics, drivers, soigneurs, masseurs and other members of the team structure. Every team will have its own allocation method. So how much did the riders make in euros and dollars? Here’s a breakdown of how the prize money is divvied up, based on 2016 figures. There is a total of €28,650 up for grabs at every one of the 21 stages of the Tour de France. Stage winners receive €11,000, runners-up €5,500 and third place gets €2,800. 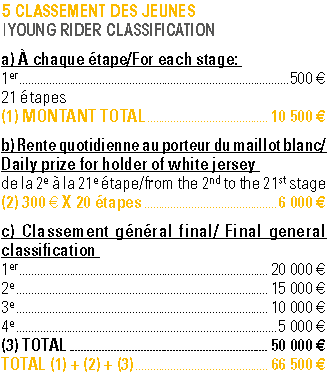 Prize money is awarded to the first 20 riders as per the table below, written in French and English. The overall winner of the Tour de France collects a cool €500,000 (AU$700,000) to be shared amongst himself and his team mates. Second place nets €200,000 (AU$280,000) while third place gets €100,000 (AU$140,000). The table below shows the breakdown of the prize money awarded to riders placing from first to nineteenth in the final classification. Riders finishing outside the top nineteen get €1,000 for their three-week effort. At the same time, the holder of the yellow jersey will get €500 per day, which adds up to a total of €10,000 for the last twenty stages. The first stage is not included because no one is wearing the yellow jersey yet. In the Tour de France, green is not only good for your eyes, but also for your hip pocket. Riders can collect prize money by winning individual sprints, holding the green jersey throughout the race and by winning the overall points classification. There are a total of 19 sprints built into the 21 stages with prize money awarded for each sprint. The three first riders to pass the sprint line will receive a prize as listed in table (a) below. The rider wearing the green jersey will net €300 per day, whereas the overall winner of the green jersey will receive €25,000. At the end of the race there is a reward for the top 8 riders in the final points classification. Not every hill in France is equal. Some are steep, some are really steep and some are nearly impossible to climb. In the Tour, mountains are put into 5 categories: categories 1 to 4 designate the steepness of a climb with 1 being the steepest. The fifth category, Hors catégorie (meaning beyond categorisation), normally describes a hill that is nearly impossible to pass. However, a hill can also become Hors catégorie if it is the final climb of a stage. The first three riders to conquer a climb will receive prize money if the climb is categorised either as Hors catégorie or as category 1. 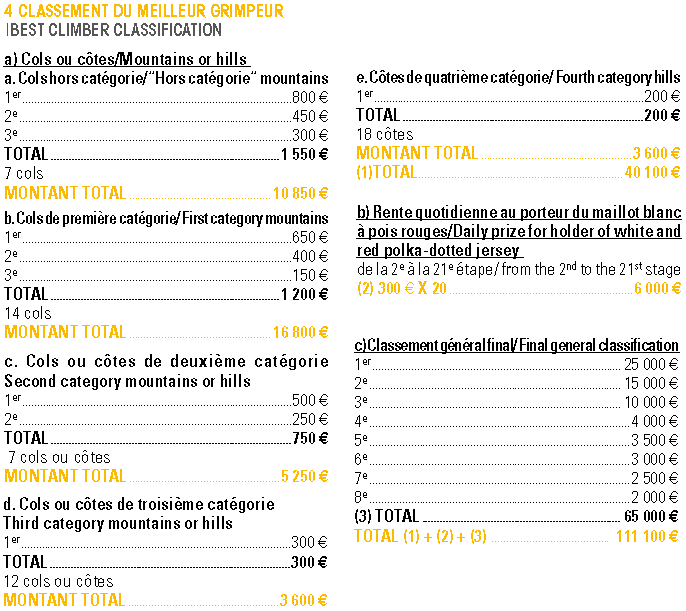 If mountains are classified below category 1, only one or two riders will receive prize money. 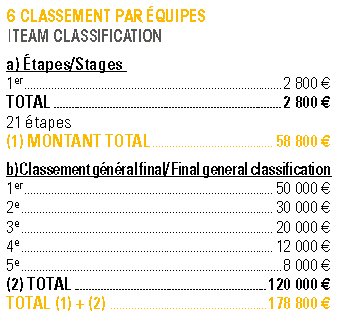 The table below shows the prize money awarded for the total of 58 cols and cotes in the 2016 Tour de France. 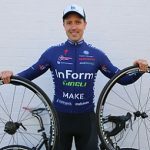 The overall winner of the polka-dot jersey will receive prize money on par with the green jersey (€25,000), with a total of 8 riders receiving a prize for final classification. The white jersey is worn by the leading young rider, who must be under the age of 26 at any point in the same calendar year to be eligible. The jersey is awarded €500 for each of the 21 “stage wins” as well as €300 for each of the 20 days it is worn throughout the race. The final winner is rewarded with €20,000. The team classification is calculated by adding up the times of the three best riders from each team, ignoring time penalties and bonuses. In time trials, the time of the fifth rider from each team is used to determine the classification winner. The winning team of each stage will collect a prize of €2,800, whereas the highest ranked team at the end of the Tour will pick up a cheque for €50,000. The top 5 teams are rewarded for their combined efforts at the end of the race. 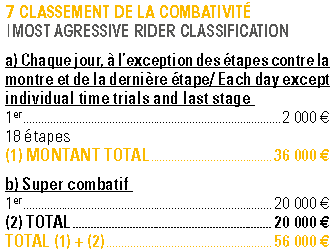 At the end of each stage, €2,000 is awarded to the most aggressive rider for the day, excluding time trials and the final stage. The winner of this prize is determined by a jury of 8 cycling experts. 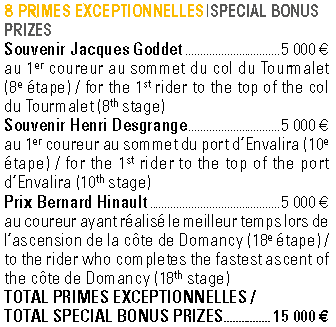 At the end of the Tour, an overall Super Combatif is rewarded with €20,000 in prize money. Finally, special bonus prizes of €5,000 are given to the first rider to pass specific climbs. In 2016, there were three of such ascents, adding €15,000 to the total prize pool. So that is how the €2,295,850 prize pool is divvied up. Have a look out for the €-signs in the eyes of the riders next time you watch the Tour de France. Why is tour de france winner get so little money compare to wimbledon winner? It looks a lot harder to go through 3 wks. So what is the net that the winner get? Easier to sell TV commercial time during a tennis match, where the game stops for side changes, ends of games, sets etc. Bike race starts and goes, uninterrupted, for several hours. No stops in action for advertising. And an attack or crash can happen at any time. Same with soccer and car races. In US they split the screen. Show ads on the left while you can wait h the race on the right. Although the soccer games go uninterrupted. In turn, the ads go uninterrupted before and after the match,, and during the halftime break.